Make up your own mind on this one. Note this picture is the Inverse Axis graph, one showing % chance of winning. Betfair have delayed settlement of this match, pending an investigation and discussion with the ATP I assume. Antonio Veic, a player I had honestly never heard of before, started this match at a price of around 5.5 (18% winning chance). Guillermo Canas, a player nearing the end of his career and with two previous suspensions for taking banned substances was the heavy favourite, around 1.2. Now from the graph, you'd think Veic won in straight sets. He didn't, he actually lost the first set, yet kept on shortening in price (increasing in percentage chance of winning). Expect this one to be in the papers and dragging tennis back into the gutter again. Without seeing the match, it's hard to hang the bloke. He may have rolled an ankle and battled hard to win the first set despite really struggling. But any betting forum will tell you this one looks mighty fishy. UPDATE - The HeraldSun has picked up on the story here. There is a photo of Canas receiving treatment on his shoulder in this Australian forum, but no indication of exactly when the timeout was taken. FINAL UPDATE - Betfair, I assume with the assistance of the ATP, have made a decision. PBZ Zagreb Indoors Tennis Tournament – Canas v Veic first round match settlement. We have investigated the markets offered on the match between Canas and Veic at the PBZ Indoors in Croatia. After detailed analysis we are satisfied the market reflected the event and in accordance with our terms and conditions the market will be settled shortly. A courtside observer initially dismissed concerns as being "BS" and simply due to those watching being aware of an injury to Canas BUT this was before he was aware of the betting patterns. When I explained the betting patterns as reflected in the odds he said they were "insane". I reported "unusual betting activity" BEFORE the match started (on www.tennisinsight.com) AND to Betfair while Canas was WINNING during the first set - AND a second time when he went a break up in the second. It is self-evident that Betfair SHOULD void these bets. The ATP should support them in reaching that conclusion and NOT PRETEND - to avoid unwelcome controversy - it was simply due to "injury". The odds on Canas went from 1.17 an hour before the match to 1.29 on commencement to 8.2 when he was ONE SET UP and 1-2 ON SERVE in the second set. These are not exceptional figures but fully representative of the betting trends throughout the match. A courtside observer said they were NOT explained by Canas' shoulder 'injury'. I watched the prices/scores move throughout the match, and generally assumed the scoreboard had the players round the wrong way. It soon became apparent something more dubious was taking place. Its hard to say just what happened...it could just be the courtsiders taking advantage of a situation, causing a massive, massive market overreaction. ...and the more I read, the more suspicious it seems. For the integrity of tennis as a sport and for betting, nothing less than a Betfair void and full ATP investigation is required. 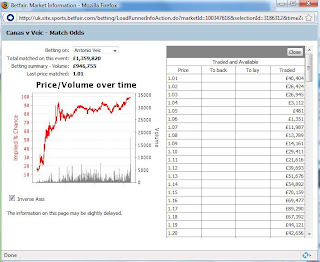 I suspect Betfair will quietly settle, and the ATP will continue to bury their collective heads in the sand. Veic traded at 1.07 whilst being a set and a break down... even if Canas only had one arm you'd expect the odds to be a little higher! Not sure about the break of serve (I didn't catch this until late), but when your serving shoulder is gone, it's very hard to win anything. I'm trying to keep an open mind on this - innocent until proven guilty, and I'd rather not have to deal with defamation lawyers. The volume traded on the match wasn't that high considering the circumstances. I was a courtsider at the match. Canas had got to 1.8, whilst a break up before he asked to see the trainer. Further I watched the points he was losing, some of his second faults ended nearer the baseline than the service line, and he never tried to hit any winners, always passing the ball over to Veic, it would have been more subtle had veic not kept hitting the net forcing Canas to play even worse to make doubly sure that he lost. SOmething that no one else has pointed out, was at the start of the third set the trainer came out, but only to talk to Canas, it struck me totally as we have all the money on, you had better make sure you lose, rather than any form of treatment.